Nanning (VNA) – Vietnam attaches importance to Pan-Tonkin Gulf economic cooperation and wants to enhance partnerships between ASEAN countries and China, Deputy Minister of Transport Nguyen Hong Truong has said at a forum in China’s Nanning city. 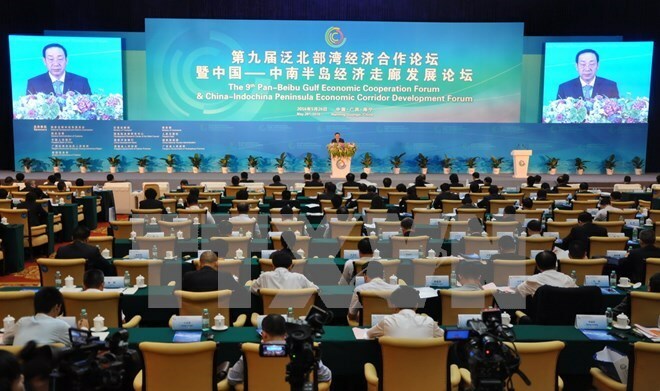 The ninth Pan-Tonkin Gulf Economic Cooperation Forum commenced in the Chinese city, which is located in the Guangxi Zhuang Autonomous Region, on May 26. It is being attended by about 500 delegates from China and the ASEAN nations. At the opening session, Deputy Minister Truong noted the outstanding achievements in the ASEAN – China dialogue relationship, including the completion of negotiations on the ASEAN – China free trade area. He highly valued opportunities brought about by the ASEAN Economic Community, established on December 31 last year, to both sides’ businesses and the regional development cooperation. Stronger cooperation between the ASEAN countries and China will augment bilateral trade, facilitate customs clearance and technology development, and improve production capacity. It will also help develop transport networks, educational cooperation, people-to-people exchanges, and collaboration in environmental and natural resources protection, he added. The official also highlighted the progress in Vietnam’s affiliation with China, including Guangxi province, recently. At the forum, participants discussed the formation of a China – mainland Southeast Asia economic corridor, and a cooperation network of Chinese and ASEAN port cities.